Not showering for a week sounds crazy, but what if your ability to resist a shower could help thousands of people on the other side of the world get access to clean water? 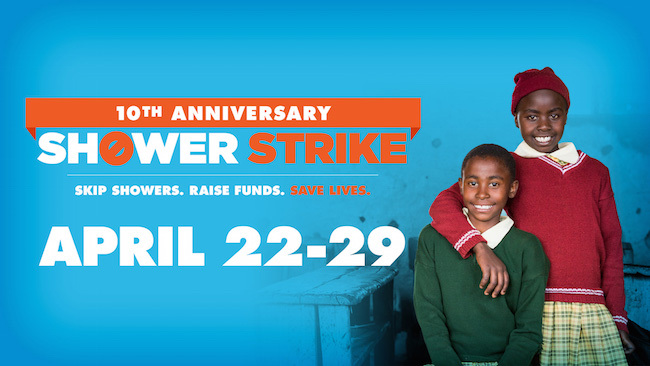 Shower Strike is your way to get involved in Well Aware’s mission of implementing clean and safe drinking water to those who need it most. Believe it or not, being smelly for a week can actually be a lot of fun. If you don’t believe me, here are a couple of ways to spice up your week of greasy hair and dirty toes. Post a ‘before’ photo at the beginning of the week on your favorite social media site, telling your friends that you will only be posting an ‘after’ photo if you raise your goal amount of money. Come up with creative ways to keep clean during the week and make an Instagram story documenting these methods and ideas. A few ways to creatively keep clean are wet wipes, sponge baths, and perfume masking any unusual smells- we’re sure you can come up with more! Use those extra 20 to 30 minutes you normally use for showering and blow drying your hair for something fun, like going for a walk, cooking a fun meal, painting, spending more time with your family, or having a dance party! The point is, not showering for a week can be daunting, but by making it into a week of fun challenges, it will fly by and you’ll be raising money for those without clean water (don’t forget to mention this if you colleagues or friend’s are taken aback by your stink)! If you’re still not convinced that not showering for a full week can be fun, take a look at some of our past Shower Strike Hall-of- Famers to see what helps them get through the week! Learn more and register for the strike here. Good luck and happy stinking!